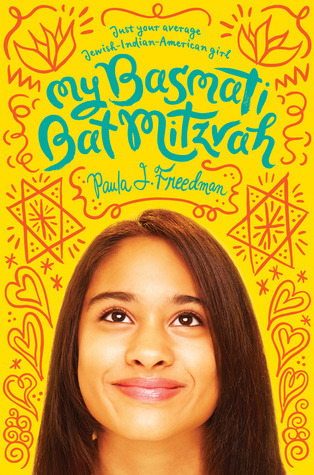 My Basmati Bat Mitzvah is a fun middle grade read. It manages to have a lot of substance whilst feeling like there wasn't much substance - which is a strange accomplishment and it is both a compliment and a criticism of the book. Tara is involved in a lot of worlds. She's of Indian descent and she is Jewish. She is questioning her faith and she (sort of) wants a bat mitzvah. She loves her parents and is frustrated by them. She loves her best friends and hates her enemies until she doesn't. She is a contradiction. She is growing up. This book tackles a lot of issues. What is a person's identity when she comes from multiple cultures? Can she have more than one identity? How do you handle friends who are growing up faster than you? How do you handle people who don't like you? How do you recover when you've made mistakes? At times, there are so many issues running through this book that it gets a bit crowded. At other times, it feels pretty flimsy. Problems arise for seemingly no reason at all. Problems resolve a little too easy. I think most of this is the function of it being more of a middle grade novel than a YA novel. Tara is a young 12/13 year old. Her immaturity is frustrating to someone accustomed to reading about older characters. I just wanted to shake her when she did some really stupid things. Despite some reservations about this book, I did enjoy it. Tara is a nice kid, if a bit immature. I really like getting the feel for Indian culture and some basic information about the bat mitzvah process. It also handled complex issues like race, faith, and growing up in sensitive and thoughtful ways. Recommendation: Grab it from the library.